There is simply little or no doubt that you have heard of Apple's new stunning 2D motion graphics compositor called Motion. Even those who were the most unwilling to appreciate Apple's accomplishments in the non-linear world stood in utter amazement at this year's National Association of Broadcasters when Apple surprised us with the announcement of Motion. Motion is so spectacular that the first question that rolls off almost everyone's tongue is, "What are the requirements?" Of course this is because Motion actually allows us to work in a real-time environment on an ordinary personal computer. What is so extraordinary about Motion is that it takes such full advantage of your PowerMac G5's fullest potential. It is a rare application, and certainly a standard-setting application in that all the major components of the PowerMac are fully used in order to afford such outstanding function. Motion uses the RAM, the video card's GPU, and of course, the CPU and hard drive extensively to achieve its real-time performance. Because of this, in order to get the best performance, one must have a PowerMac that actually operates with as few deficiencies as possible. That means a PowerMac G5 with dual G5 processors, a Radeon 9800 pro graphics card, and 2GBs of memory are what Apple recommends in order to achieve the performance we all saw at the live demonstration. Motion will work with less hardware, but you lose some of the real-time benefit that had you excited about Motion in the first place. With all of this excitement, all of us have been eagerly awaiting as much information as humanly possible from our base. Our bases are the many companies that create video-based training, books, forum-based communities, and of course, free online tutorials and reviews. 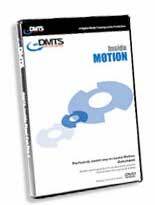 It is my distinct pleasure to review Magnet Media's DVD-based Motion training tutorial. This trainer is over 4.5 hours of training, broken down into several categories to really help you get started quickly and easily wherever you left off on training yourself in the ways of Motion. You'll need to watch this on a Macintosh with OS X, at least 256 MB of RAM, and at least 1024 x 768 video. Of course, if you are running Motion, none of this should be a problem. As you can see there is quite a bit of information to cover in this tutorial. This is because compositing is the art of combining both video and multiple layers of motion graphics to create a single output on screen that has the look you are after. You have no doubt seen movies where the background looks like another time or space. That's compositing. We have seen text appear over water, or text disintegrating over water. That's motion graphics and composting. Motion graphics and compositing combine several arts into one. Anyone working with a green or blue screen compositing, text and text animation over video, or generated effects over video--are all motion graphics and compositing artists. They use many tools to create the look they're after. Each of these tools could easily become their own focus. Lessons 1 and 2 are meant to describe Motion to you and give you a concept of where the tools are that accomplish the tasks I have mentioned above, and more. Before we can ever begin to composite we'll have to understand how to collect our assets and how the application will function at least on a basic level. This is a very good section and I am quite impressed with the level of care that went into it. This is more than a description of what the interface's many functions are. As the interface is explained, you work with assets provided on the DVD to experience for yourself first-hand exactly what the functions are and how the application will react to these assets given varying conditions. You'll learn to import audio, images, image sequences, and more, as you work with all the major areas of the application's interface. This is where we learn every button, every hidden panel, and every place a setting is hiding and of course the most important lesson of all, you learn the language of Motion. That means you understand what the major sections and functions are called. This is essential in learning a new application, because as students we cannot even begin to ask questions or use references until we understand the vocabulary of the application itself. Therefore, I highly recommend you roll up your sleeves and get ready to follow along with the instructor right at the very beginning of lesson 2. Lesson 3 is close to hour of instruction and is quite diverse as well. Motion has right from the start caught my attention just because of its unique mechanics. As you start lesson 3, you begin to do things like drag audio into the canvas and begin to work with the timeline. There are practical lessons to be learned this early on in the training, such as making lower thirds, positioning objects in the timeline, and basic animation with keyframes. Of course, one of the big features that have many excited about Motion is the whole concept of what is now known as Behaviors. Magnet Media has the most wonderful way of describing what behaviors are. As behaviors are explained, the very bullet points on screen are changing visuals that make use of these behaviors, which illustrate the concepts being introduced. As you hear what behaviors are, you see them in action. It's quite easy to get a little excited watching this section because you know you're about to be taught how to do all the neat things you just saw. Particle generators have never been so inexpensive and fun to use. If you're not sure how a particle system works, the explanation here is nothing short of impressive. We learn all about two building blocks of the particle system, which would be the Cell and the Emitter. We start by learning the basic settings of the cell using the Dashboard. The Birth Rate, Life, Speed, Spin, Scale Range, and the optimizations such as using points or wireframes rather than images as your particle display method. You learn this section by pulling a specific layer from a Photoshop layered image containing balloons. I think this is a nice touch because it shows how you bring in just a single layer as an object from a multi-layered Photoshop document, and use that layer as a cell in a particle system. Because you are using an image and not a pre-packaged particle system that might use a less obvious graphic, you have the opportunity to really understand exactly how these settings will actually affect a cell you want to work with. As you progress in lesson 4, you learn to use the property inspector to better fine-tune advanced cell properties. If you haven't had a chance to really study the particle system, this is a great way to learn it very quickly. This is a great introduction within itself to more of the features that have so many people so excited about Motion. We're learning how to create moving textures within text with live video, and we have behaviors and keyframes at our disposal. Think about how difficult this is without Motion. You begin by watching a great composite you will learn to build step by step. It's chock-full of fun effects, and in order to accomplish this, you'll learn all about markers, filters, and adding textures to text and blend modes. Some of the earlier lessons are reinforced here as well, such as working with audio, the mini timeline, and the larger, more featured timeline. Once you have all the basic lessons completed you move into more advanced functions such as Masking and Keying, which are covered in lessons 6 and 8, respectively. Though the keying section is only a mere 15 minutes long, it is more than thorough enough to give you the basic tools you need to key out a background and composite a scene. I think you're going to enjoy this section immensely. Advanced keying lessons will often leave beginners scratching their heads. This simple lesson will provide you with all the basic tools and explanations you need to understand and work through basic keying. Lesson 7 is a great tutorial on Roundtripping. This section teaches you how to work with Motion as an integrated part of Final Cut Pro and DVD Studio Pro. Many of you know these programs were designed to work well together, but if you didn't already know that you could import Motion projects directly into Final Cut Pro and DVD Studio Pro then this section will be of great interest to you. It can save you lots of time, and expand the tools you already have in these other applications. For those among us that use a tablet, such as the Wacom tablet, you will be most interested in learning to use the Gestures Motion affords you. Especially those fortunate enough to be using a Cintiq interactive pen display: You bought one for a reason, and believe me, you didn't know this was the reason until now. It's simply amazing, the functionality Gestures provide. Finally, lesson 10 concludes with tips to speed up your output and export to various types, such as DV or MPEG2 via compressor. Magnet Media has really stepped up their training series yet again with this new release. I immediately noticed the much more polished interface and added overlays during the video. These really help you remember keyboard short cuts and where you are in the training series. Motion is still a pretty new application and you might think that these tutorials wouldn't have the kind of depth the subject deserves, but this is not the case. Each lesson is well prepared and in sequence so that you learn in a practical order all the features that Motion has to offer. Magnet Media also made use of visuals specifically designed to make these concepts much easier to understand for those who are new to the world of compositing and motion graphics. If you're looking for a hands-on approach to learning Motion that won't take weeks out of your schedule, you have found it.